When used with GRAS 43AD articitial ear or GRAS 43AE IEC 60711 ear simulator, and a GRAS 44AA/GRAS 44AB mouth simulator, it can be set up for testing telephone handsets in accordance with ITU-T recommendations. Four different, detachable precision brackets are provided for mounting the Mouth Simulator according to the standardised positions shown in the table for speaking into a telephone. These positions are maintained to within an accuracy of 1 mm. Reference gauges are available for verifying this. 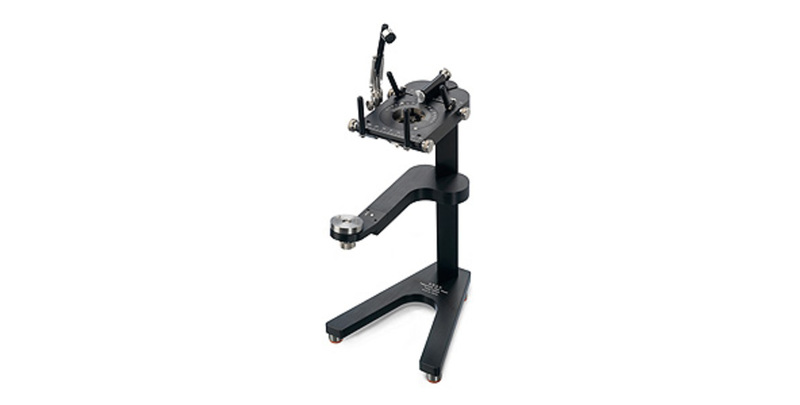 The GRAS 45AA stands on four anti-vibration mounts to isolate it from extraneous vibrations which could otherwise lead to spurious measurement results. The GRAS 45AA is provided with graduated guides and stops for aligning a telephone handset correctly in position over the Artificial Ear. Lateral guides are independently adjustable to cater for asymmetrical handsets. Once aligned, an adjustable spring-loaded, padded clamp will hold the handset in position. As specified in some tests, an adjustable force may also be applied by adding a small mass to the measurement object. GRAS 44AA, 44AB, 43AD and 43AE products. See www.gras.dk.